Tomorrow, the U.S. Bureau of Labor Statistics will release its employment numbers for the month of July, the first month since the U.S. Supreme Court issued a 5-4 decision in Janus v. AFSCME. This decision threatens the ability of public-sector workers to form strong unions to bargain for decent wages and work benefits. In an amicus brief filed in the case, President Donald Trump stood with corporate interests instead of unionized workers—despite his many promises to stand up for working people. While the president will likely trumpet tomorrow’s jobs numbers as proof that he is working for everyday Americans, the salient question about today’s labor market is how workers can continue to weather slow wage growth as the economy nears full employment. This column details how the Trump administration’s actions are undermining the power of working people in the U.S. economy—whether they are unionized or not—as well as how little the administration is doing to address the fundamental challenges American workers face. Research consistently illustrates the key role that unions play in raising wages and curtailing income inequality over time. As shown in Figure 1, unionization raises the average worker’s wage nearly 14 percent. In other words, there exists a so-called union premium that grants union workers significantly higher wages than their nonunion worker counterparts. Moreover, research shows that when unions are strong, all workers, regardless of union status, earn higher wages; children born into poverty have a better shot at earning higher incomes as adults; and the wealthiest Americans’ runaway incomes are constrained. A new working paper from economists at Princeton University and Columbia University utilizes new micro-level data on union membership to identify unions’ substantial narrowing effect on wage inequality throughout the 20th century. 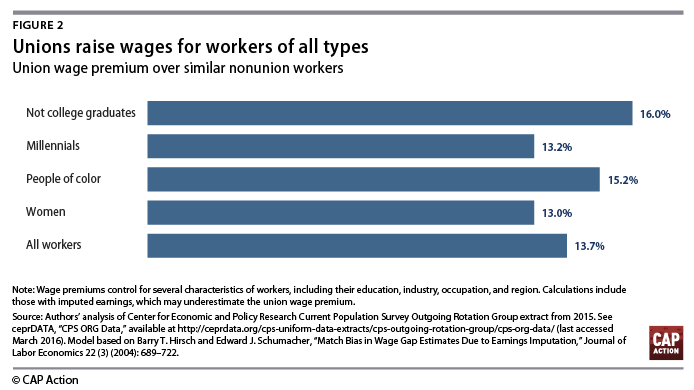 Figure 1 demonstrates that the union wage premium exists across all types of workers—but it is greater for noncollege graduates and people of color. And while female union members still earn less than male union members, their gender wage gap is a fraction of the size of the pay gap that their nonunionized counterparts face. Elise Gould and Celine McNicholas of the Economic Policy Institute (EPI) found a 4 percentage-point reduction in the gender wage gap among unionized workers compared with nonunionized workers, even after controlling for variables such as education, experience, and geographic division. Collective bargaining helps level the playing field among workers, giving voice to those who are systematically paid less than their fair share. While unions are sometimes associated with white- and male-dominated industries such as the steel, automobile, and electricity industries, according to the EPI, nearly two-thirds of union members between ages 18 and 64 are women and/or people of color. Unions are especially beneficial to these workers, who often face challenges in the workplace such as discrimination and pay inequity. As policymakers seek to better understand the labor market that has given rise to slow wage growth near full employment, macroeconomic policy has started to take a closer look at the discrimination that unions help address. Unions are also key to securing fundamental benefits such as paid leave. A National Longitudinal Survey of Youth analysis found that union workers are 16 percent more likely to use paid maternity leave due to increased availability, awareness, and affordability. Furthermore, unions can help increase workplace safety for all workers. In Las Vegas—a city that has a large proportion of organized servers and housekeepers—workers will soon be provided with panic buttons as a safeguard against sexual harassment, thanks to negotiations between unions and casino operators. In short, unions have played a key role in making advanced Western economies responsive to everyday workers. In Germany, unions play a central role in corporate governance, helping companies stay productive and ensuring that gains from productivity are shared with workers. 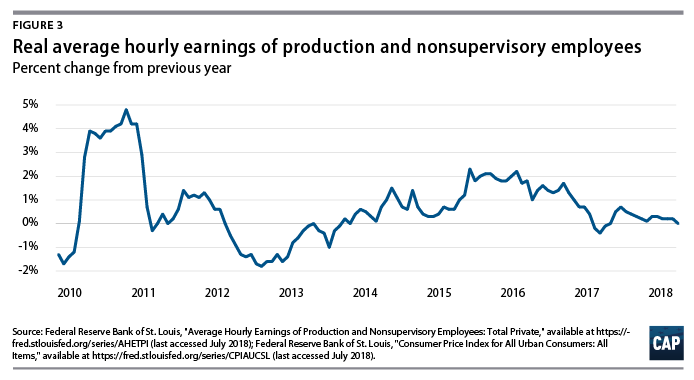 This has resulted in broad-based wage growth. In the United States, unions play a pivotal role in elevating the voices of immigrant workers in the fight for comprehensive immigration reform and pushing back on harmful family separation policies and illegal U.S. Immigration and Customs Enforcement raids on workplaces. Unions are also central to the rights of LBGT workers. A recent op-ed in The New York Times argued that of all the cases heard this term, the Supreme Court’s Janus decision presented the most significant harm to LGBT rights, given that nondiscrimination provisions in collective bargaining agreements often serve as workers’ only protection against discrimination on the basis of sexual orientation or gender identity. Despite unions’ myriad benefits, decades of anti-union attacks have chipped away at unions’ ability to sustainably provide equitable representation to all employees. Today, the Trump administration is employing every possible level of power to curtail protections for unions. For example, the administration filed an amicus brief in the Janus case siding against unionized workers; nominated Brett Kavanaugh, a demonstrable foe to labor, to the Supreme Court; and introduced draft rules that make it harder for home care workers to organize into strong unions. 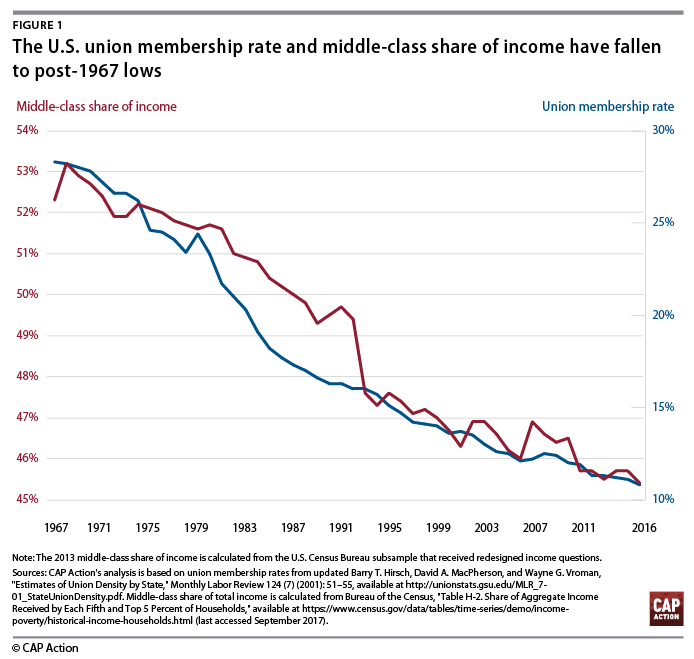 As seen in Figure 2, union membership has severely declined in recent decades. In 1967, more than 1 out of every 4 workers in America was a member of a union. 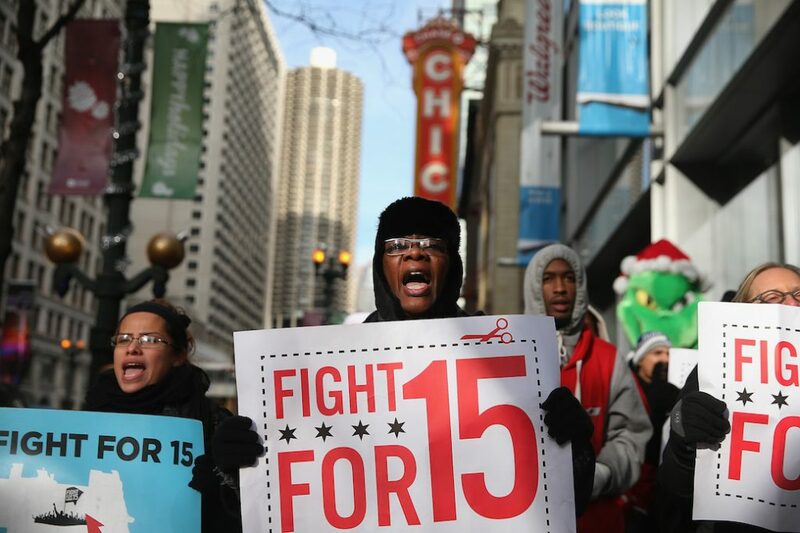 Today, only about 11 percent of workers in America belong to a union. In addition to the benefits and protections unions provide to workers in unionized industries, unions serve as a key component of overall economic well-being. Studies have shown that the decline in unionization accounts for one-third of the growth in male wage inequality and one-fifth of the growth in female wage inequality. And despite the current growth in gross domestic product, real wages are not keeping pace with the cost of living, as shown in Figure 3. This is further proof that policies that weaken worker power—such as union busting—are detrimental to the American economy. In touting exaggerated claims about the economy and boasting, President Trump is distracting from the economic reality of ordinary workers. Although some indicators suggest that the economy is strong, further analysis proves it is not working for everyone. For example, most LGBTQ workers are completely excluded from most national surveys, and black women face disproportionately high unemployment rates compared with overall unemployment. Indicators such as these prove the need for wider analysis that takes into account nontraditional economic indicators that are often ignored such as workers’ sexual orientation or other identities not included in broader wage analysis. As part of the broader Trump agenda—including tax cuts for the rich and bank deregulation, among other harmful policies—the Janus decision exacerbates an economic approach that has siphoned. Policymakers and economists should consider the state of union workers when considering the health of the labor market. President Trump’s policies have curbed labor rights across the board, from undermining workplace safety to handing corporations a tax cut that simply does not benefit workers. Women and people of color, who constitute a core union demographic and who are disproportionately reliant on the workplace rights and protections that unions negotiate, can be expected to bear the brunt of these policy decisions. Unfortunately, the Janus decision and President Trump’s response to it are further proof that this administration is not committed to improving the lives of American workers. The retirement of Supreme Court Justice Anthony Kennedy presents yet another opportunity for President Trump to shape the judicial agenda in a way that harms workers. Cases are currently pending on age discrimination in employment and employment taxes. The administration should be supporting working-class people—not attempting to damage the support that unions offer to workers who need it most. Safia Sayed is an intern for Economic Policy at the Center for American Progress. Daniella Zessoules is a special assistant for Economic Policy at the Center. Galen Hendricks is a special assistant for Economic Policy at the Center. Michael Madowitz is an economist at the Center.